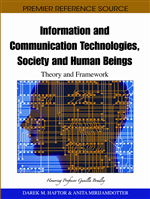 The chapter starts by elucidating the concept of the contemporary media environment as a complex interaction of two computing variables: the growth of personal computers, and the popularity of the Internet and World Wide Web. This environment is then analysed for its impacts on collective processes in both virtual and physical communities. It is argued that these collective processes contain multiplier effects; and one of these effects lies in the subtractability of resources; an important concept in the knowledge commons. Examples are used to illustrate these perspectives. The author maintains, throughout the chapter, that it is essential to see all of these interactions as two-way, dialogical relationships and structuration theory is used in support of this argument. As a concluding note, the chapter makes a number of forecasts on the benefits and potential pitfalls for the society as a result of these relationships. The best and most interesting ideas in the social sciences (a) participate in fostering the climate of opinion and the social processes which give rise to them, (b) are in greater or lesser degree entwined with theories-in-use which help to constitute those processes and (c) are thus unlikely to be clearly distinct from considered reflection which lay actors may bring to bear in so far as they discursively articulate, or improve upon, theories-in-use (Giddens, 1984, p. 34). This clearly articulated the recursive nature of human relationships in communities. In the everyday exchanges between human actions and structures, people are also constantly transforming the very same structures that empower or constrain their actions. This insight is essential in realising that the study of people and their interactions with various political, technological, social, or economic structures there is the inevitable dilemma of structure and agency. In other words, studies involving human communities must account for both objective and subjective realities. Structure as the medium and outcome of the conduct it recursively organizes; the structural properties of social systems do not exist outside of action but are chronically implicated in its production and reproduction (Giddens, 1984, p. 374).